Figure 1. 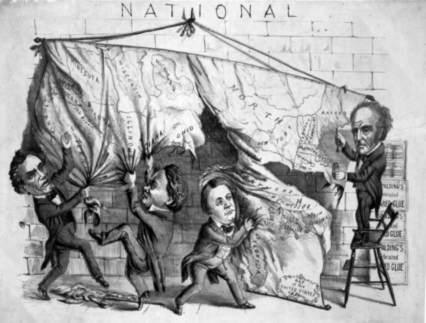 An 1860 political cartoon shows the four presidential candidates of (left to right) Abraham Lincoln, Stephen Douglas, John C. Breckenridge, and John Bell dividing the United States map. Courtesy of Natural Concepts. During the controversial 1860 presidential election, Landon Carter Haynes campaigned for John C. Breckenridge as the (Southern) Democratic presidential elector. In his campaigning, Haynes traveled throughout East Tennessee, and in a possible attempt to expand his political outreach, he purchased a lot in Knoxville, Tennessee. With the election of Abraham Lincoln and the beginning of secession talk, Landon Carter Haynes strongly advocated Tennessee’s secession. Even before Tennessee and many other Southern states seceded, Haynes delivered a pro-secession speech in Knoxville in January, 1861. In his speech, he asserted that Tennessee should “…feel that her union with the Southern States…is natural and inseparable, and the unalterable condition of her present and future safety, prosperity, and independence” is bound to the South. To the pleasure of Haynes, Tennessee seceded later that year. 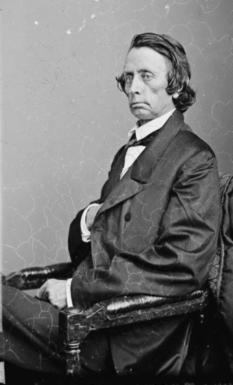 Landon Carter Haynes’ support and openness of Tennessee’s secession led to his unanimous election to represent Tennessee in the Confederate States of America Congress from 1862 to 1865. During the First and Second Congressional sessions, Haynes participated on several committees: Judiciary, Patents, Post Offices and Post Roads, Printing, Commerce and Engrossment and Enrollment (which he chaired in the First Congress). Recent research of the Confederate Conscription Act of 1862 reveals that Landon Carter Haynes contributed more to this act than what was previously known. The Confederate Conscription Act of 1862 was the first ever draft enforced in America. Even with this act, certain people of the Confederacy were exempt from being drafted. The “Twenty Slave Clause” allowed at least one male (owner or overseer) to be exempt from the draft if he owned or was to oversee twenty or more slaves. Haynes voted against the “twenty slave” amendment when Congress passed an exemption bill in the fall of 1862. Also, Haynes proposed and voted on another part of the exemption bill that pertained to the members of local militia. Being passed along with the “twenty slave” amendment, Haynes’ militia amendment stated that local militia members were exempt from the draft provided that it was necessary for the militia members to be present to repel possible invasions from the enemy. 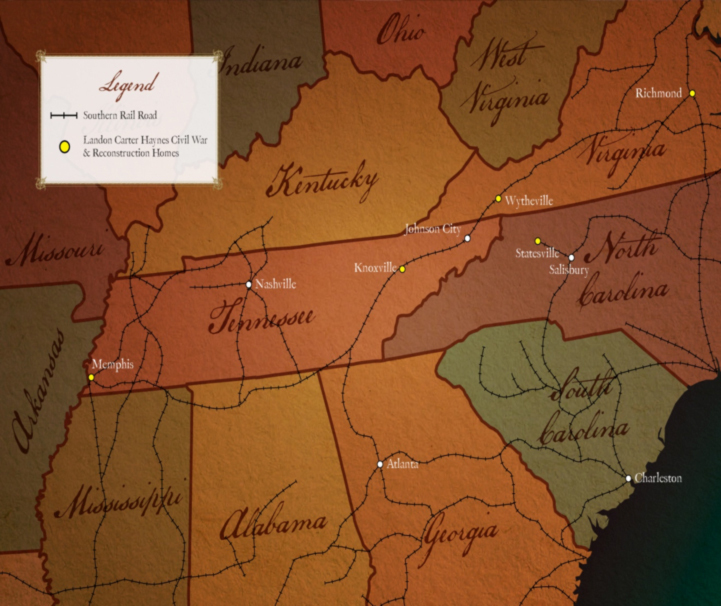 While not attending to Congress in the Confederate capitol of Richmond, Virginia, Landon Carter Haynes lived with his family in Knoxville. When not worrying about the issues of Congress, Haynes also fretted about his two oldest sons. By mid-1862 Robert and Joseph Haynes had both enlisted in the Confederate army. Being officers, limited battle action was seen by both during the war. However, both were mainly stationed in East Tennessee, Southwest Virginia, and Western North Carolina. Robert was also a part of Confederate General Braxton Bragg’s Kentucky Campaign of 1862. In addition, Robert Haynes married Drucilia “Drusie” Cornelia Powell in Knoxville in 1863. Figure 2. 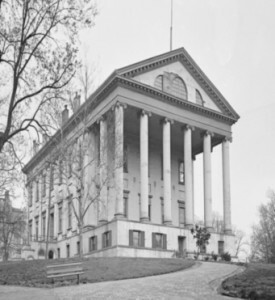 A photograph of the Confederate capitol in Richmond, Virginia. Courtesy of Natural Concepts. As the war progressed in 1863, Knoxville was threatened by a Federal raid in June. With a limited number of Confederate troops defending the town, local citizens participated in the defense. Confederate Lieutenant Colonel Milton A. Haynes (no relation) in his report of the raid states, “Among many citizens who reported to me that day for duty, I must not forget to mention Hon. Landon C. Haynes….” With such bravery, Haynes and the Confederate defenders thwarted the Federal raiders from Knoxville and their homes. Although Knoxville was saved for the moment, a few months later in September of 1863, Knoxville fell to a Federal army under the command of General Ambrose Burnside. With the fall of Knoxville, Landon Carter Haynes relocated with his family to Wytheville, Virginia. Disgusted with how little attention was given in maintaining Confederate control of Knoxville by the government, Haynes attributed and charged Confederate President Jefferson Davis with the fall of Knoxville and of his home state of Tennessee. Not only was his home state under Federal authority, but his farm in Haynesville was as well. As the war continued to progress while Landon Carter Haynes lived in Wytheville and participated in Congress in 1864 and early 1865, the Confederacy’s existence was becoming all but lost. As Petersburg, Virginia fell to Federal hands, the Confederate government in Richmond decided to evacuate in early April 1865. Congress was in session at this time, so Haynes and his family joined the refugee government in their flight to North Carolina – the last remaining state in Confederate control. Along the way, Haynes stopped in Statesville, North Carolina. With Confederate armies surrendering throughout the South, the war also came to an end for Haynes in Statesville. He was arrested and told to stay in town until paroled or pardoned by the United States government. Figure 4. 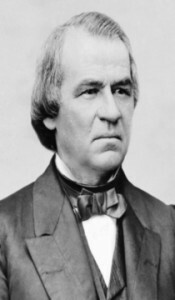 Civil War era photograph of Andrew Johnson. Courtesy of the Library of Congress Prints and Photographs Division. With the conclusion of the Civil War and Landon Carter Haynes living in Statesville, President Andrew Johnson issued his amnesty proclamation on May 29, 1865. This amnesty proclamation was extended to former Confederates seeking parole and pardon for their participation during the rebellion. When granted amnesty by the United States government, all rights protected by the Constitution would be fully restored back to each individual, except the right of owning former slaves. Not long after, Landon Carter Haynes applied for pardon under President Johnson’s amnesty proclamation. On August 20, 1865, Haynes traveled to nearby Salisbury, North Carolina and took the oath of allegiance to the United States. Also on that same day, Haynes wrote a letter to former rival, now President Johnson. In the letter, Haynes requested a personal interview with President Johnson and inquired of Johnson to allow him to travel to Washington, D. C. for the interview. It is not known if President Johnson replied to Haynes’ request or if the personal interview ever took place. Sir: You know Mr. Haynes better than I do. He has been leading a very quiet life at Statesville, in this State. Chief Justice Pearson [Richmond M. Pearson, serving in the state’s Supreme Court at the time] and Judge Fowle, [Daniel G. Fowle, serving as the judge of the state’s superior court] whose letters are enclosed, recommend that he be pardoned. Figure 5. Civil War era photograph of William Brownlow. Courtesy of the Library of Congress Prints and Photographs Division. After taking the oath of allegiance in August, Landon Carter Haynes was paroled but not officially pardoned yet. As Haynes remained in North Carolina, his farm back in East Tennessee was auctioned off by the Federal government. With his farm gone and fearing possible retribution from Unionists in East Tennessee, Haynes decided in February of 1866 to relocate with his family to Memphis, Tennessee. This almost proved to be a dreadful decision. With Haynes not officially pardoned and now residing in Tennessee, newly elected Governor William Brownlow (Republican), former political and personal rival and staunch East Tennessee Unionist, had the Federal Court in Knoxville indict Haynes for treason in the spring of 1866 for his participation with the secession movement in Tennessee. The stunned Haynes wrote President Andrew Johnson on June 6, 1866 appealing for him to step in on his behalf since the government had still not accepted his pardon petition in almost a year, which made possible his indictment by Governor Brownlow. Five days later, Haynes was officially pardoned by President Johnson on June 11, 1866 and the treason charge was dropped. Figure 6. 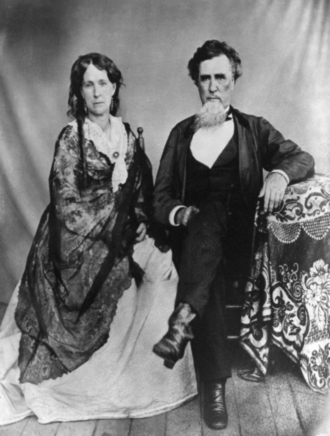 This photograph of Landon and Eleanor Haynes was taken sometime after the Civil War while they were living in Memphis. Being formally pardoned, the Civil War was officially over for Landon Carter Haynes. He was then able to settle comfortably in Memphis with his family to start anew during Reconstruction. Immediately Haynes pursued his passion – practicing law. He joined three other men in town and they established the Office of Haynes, Heath, Lewis & Lee, Attorneys at Law. Figure 7. A letterhead of the Memphis attorney office of Haynes and his partners. In 1872, Haynes once again returned to the public spot light. One public appearance that year was his attendance at a banquet in Jackson, Tennessee that was held in honor of the bench and bar during a session of the Supreme Court. During the banquet, Haynes gave his resplendent “Ode to Tennessee” speech in response to a toast from former Confederate General Nathan Bedford Forrest. The other public appearance was his last dealing with politics. That year the Democratic Party in Memphis selected Haynes as their candidate for Congress. Haynes’ opponent was Republican Barbour Lewis. Throughout the campaign Haynes attacked Lewis’ ability as a political leader, as an honest man, and the Republican Party. At one point during the campaign, Haynes slandered Lewis by calling him a “carpetbagger” – a name given to Northerners and Republicans seeking political and financial benefit from the war torn South during the Reconstruction. 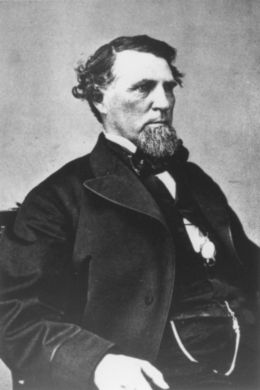 In the end, Landon Carter Haynes’ reputation of being a former secessionist and Confederate senator led to his defeat. Resolved; That in the death of Landon C. Haynes, the Bar has been deprived of one of its most gifted members; that society has lost a most noble gentlemen, and that the community has lost one of its most distinguished citizens. Resolved; That the members of this Bar tender to his bereaved and stricken family their heart felt condolence, in this hour of their deep affliction. Haynes was buried in Memphis, but years after his death, his son Robert reinterred him in Jackson, Tennessee where he lived and practiced law as his father did. With this reinterment, the great East Tennessee Orator now rests in an unmarked grave. Confederate Senator Haynes traveled during and after the Civil War. Courtesy of Natural Concepts. Philip M. Hamer, Tennessee: A History, 1673-1932 (New York: The American Historical Society, Inc., 1933), 1: 531. Confederate Senate, Journal of the Congress of the Confederate States of America, 1861-1865 (Washington: Government Printing Office, 1904), 2: 294-297 & 311-312. Haynes, Landon Carter: from The War of the Rebellion: A Compilation of the Official Records, Tipton-Haynes Historic Site Civil War Exhibit Collection, Tipton-Haynes State Historic Site, Johnson City, Tennessee. Haynes, Landon Carter: presidential pardon file (1865-66), Tipton-Haynes Historic Site Civil War Exhibit Collection, Tipton-Haynes State Historic Site, Johnson City, Tennessee. Haynes, Landon Carter: from Fraser, Walter J. Jr., “Barbour Lewis: A Carpetbagger Reconsidered” (1973), Tipton-Haynes Historic Site Civil War Exhibit Collection, Tipton-Haynes State Historic Site, Johnson City, Tennessee. Haynes, Landon Carter: Memphis (Tenn.) documents, Tipton-Haynes Historic Site Civil War Collection, Tipton-Haynes State Historic Site, Johnson City, Tennessee. Confederate Senate. Journal of the Congress of the Confederate States of America, 1861-1865. Vol. 2. Washington: Government Printing Office, 1904.